"Amelie" redirects here. For other uses, see Amélie (disambiguation). Amélie (also known as Le Fabuleux Destin d'Amélie Poulain; French pronunciation: ​[lə fa.by.lø des.tɛ̃ d‿a.me.li puˈlɛ̃]; English: The Fabulous Destiny of Amélie Poulain) is a 2001 French romantic comedy film directed by Jean-Pierre Jeunet. Written by Jeunet with Guillaume Laurant, the film is a whimsical depiction of contemporary Parisian life, set in Montmartre. It tells the story of a shy waitress, played by Audrey Tautou, who decides to change the lives of those around her for the better while struggling with her own isolation. The film was a co-production between companies in France and Germany. Taking in over $33 million in a limited theatrical release, it is to date the highest-grossing French-language film released in the United States, and one of the biggest international successes for a French movie. The film received critical acclaim and was a major box office success. Amélie won Best Film at the European Film Awards; it also won four César Awards in 2002 (including Best Film and Best Director), two BAFTA Awards (including Best Original Screenplay), and was nominated for five Academy Awards. Amélie Poulain (Audrey Tautou) is born in June 1974 and raised by eccentric parents who – incorrectly believing that she has a heart defect – decide to home school her. To cope with her loneliness, Amélie develops an active imagination and a mischievous personality. When Amélie is six, her mother, Amandine (Lorella Cravotta), is killed when a suicidal Canadian tourist jumps from the roof of Notre-Dame de Paris and lands on her. As a result, her father Raphaël (Rufus) withdraws more and more from society. 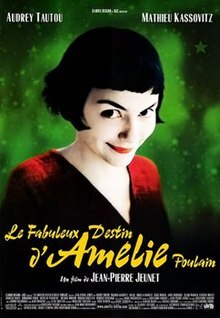 Amélie leaves home at the age of 18 and becomes a waitress at the Café des 2 Moulins in Montmartre, which is staffed and frequented by a collection of eccentrics. She is single but not a virgin; she lets her imagination roam freely, and finds contentment in simple pleasures like dipping her hand into grain sacks and cracking crème brûlée with a spoon. On 31 August 1997, startled by the news of the death of Diana, Princess of Wales, Amélie drops a plastic perfume-stopper which dislodges a wall tile and accidentally reveals an old metal box of childhood memorabilia hidden by a boy who had lived in her apartment decades earlier. Amélie resolves to track down the boy and return the box to him. She promises herself that if it makes him happy, she will devote her life to bringing happiness to others. After asking the apartment's concierge and several old tenants about the boy's identity, Amélie meets her reclusive neighbour, Raymond Dufayel (Serge Merlin), an artist with brittle bone disease who repaints Luncheon of the Boating Party by Pierre-Auguste Renoir every year. He correctly recalls the boy's name as "Bretodeau". Amélie quickly finds the man, Dominique Bretodeau (Maurice Bénichou), and surreptitiously gives him the box. Moved to tears by the discovery and the memories it holds, Bretodeau resolves to reconcile with his estranged daughter and the grandson he has never met. Amélie happily embarks on her new mission. Amélie secretly executes complex schemes that affect the lives of those around her. She escorts a blind man to the Métro station, giving him a rich description of the street scenes he passes. She persuades her father to follow his dream of touring the world by stealing his garden gnome and having a flight attendant friend airmail pictures of it posing with landmarks from all over the world. She starts a romance between her hypochondriacal co-worker Georgette (Isabelle Nanty) and Joseph (Dominique Pinon), one of the customers in the bar. She convinces Madeleine Wallace (Yolande Moreau), the concierge of her block of flats, that the husband who abandoned her had sent her a final conciliatory love letter just before his accidental death years before. She uses gaslighting tactics on Collignon (Urbain Cancelier), the nasty greengrocer. Mentally exhausted, Collignon no longer abuses his meek but good-natured assistant Lucien (Jamel Debbouze). A delighted Lucien takes charge at the grocery stand. Mr. Dufayel, having observed Amélie, begins a conversation with her about his painting. Although he has copied the same painting 20 times, he has never quite captured the look of the girl drinking a glass of water. They discuss the meaning of this character, and over several conversations, Amélie begins projecting her loneliness onto the image. Dufayel recognizes this and uses the girl in the painting to push Amélie to examine her attraction to a quirky young man, Nino Quincampoix (Mathieu Kassovitz), who collects the discarded photographs of strangers from passport photo booths. When Amélie bumps into Nino a second time, she realizes she is falling in love with him. He accidentally drops a photo album in the street. Amélie retrieves it. Amélie plays a cat-and-mouse game with Nino around Paris before returning his treasured album anonymously. After arranging a meeting at the 2 Moulins, Amélie panics and tries to deny her identity. Her co-worker, Gina (Clotilde Mollet), concerned for Amélie's well-being, screens Nino for her; Joseph's comment about this misleads Amélie to believe she has lost Nino to Gina. It takes Dufayel's insight to give her the courage to pursue Nino, resulting in a romantic night together and the beginning of a relationship. Amélie finally finds happiness for herself. Serge Merlin as Raymond Dufayel, "The Glass Man"
In his DVD commentary, Jeunet explains that he originally wrote the role of Amélie for the English actress Emily Watson; in the original draft, Amélie's father was an Englishman living in London. However, Watson's French was not strong, and when she became unavailable to shoot the film, owing to a conflict with the filming of Gosford Park, Jeunet rewrote the screenplay for a French actress. Audrey Tautou was the first actress he auditioned having seen her on the poster for the 1999 film Venus Beauty Institute. The movie was filmed mainly in Paris. 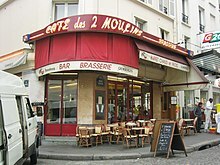 The Café des 2 Moulins (15 Rue Lepic, Montmartre, Paris) where Amélie works is a real place. The filmmakers made use of computer-generated imagery and a digital intermediate. The studio scenes were filmed in the Coloneum Studio in Cologne (Germany). The film shares many of the themes in the plot with second half of the 1994 film Chungking Express. The film was released in France, Belgium, and French-speaking western Switzerland in April 2001, with subsequent screenings at various film festivals followed by releases around the world. It received limited releases in North America, the United Kingdom, and Australasia later in 2001. Cannes Film Festival selector Gilles Jacob described Amélie as "uninteresting", and therefore it was not screened at the festival, although the version he viewed was an early cut without music. The absence of Amélie at the festival caused something of a controversy because of the warm welcome by the French media and audience in contrast with the reaction of the selector. David Martin-Jones, in an article in Senses of Cinema, stated that the film "[wears] its national [French] identity on its sleeve" and that this attracted both audiences of mainstream movies and those of arthouse ones. On Rotten Tomatoes, the film has an 89% approval rating, based on 178 reviews, with an average rating of 8.1/10. The website's critical consensus reads, "The feel-good Amélie is a lively, fanciful charmer, showcasing Audrey Tautou as its delightful heroine". On Metacritic, the film has a score of 69 out of 100, based on 31 critics, indicating "generally favorable reviews". Alan Morrison from Empire Online gave Amélie five stars and called it "one of the year's best, with crossover potential along the lines of Cyrano De Bergerac and Il Postino. Given its quirky heart, it might well surpass them all". Paul Tatara of CNN praised Amélie's playful nature. In his review, he wrote, "Its whimsical, free-ranging nature is often enchanting; the first hour, in particular, is brimming with amiable, sardonic laughs". The film was attacked by critic Serge Kaganski of Les Inrockuptibles for an unrealistic and picturesque vision of a bygone French society with few ethnic minorities. Jeunet dismissed the criticism by pointing out that the photo collection contains pictures of people from numerous ethnic backgrounds, and that Jamel Debbouze, who plays Lucien, is of Moroccan descent. The film was selected by The New York Times as one of "The Best 1,000 Movies Ever Made". The film placed No. 2 in Empire magazine's "The 100 Best Films of World Cinema". Paste magazine ranked it second on its list of the 50 Best Movies of the Decade (2000–2009). In August of that same year, BBC Magazine conducted a poll on the 21st century's 100 greatest films so far, with Amélie ranking at number 87. Entertainment Weekly named the film poster one of the best on its list of the top 25 film posters in the past 25 years. It also named Amélie setting up a wild goose chase for her beloved Nino all through Paris as No. 9 on its list of top 25 Romantic Gestures. In 2010, an online public poll by the American Cinematographer – the house journal of the American Society of Cinematographers – named Amélie the best shot film of the decade. The soundtrack to Amélie was composed by Yann Tiersen. On 23 August 2013, composer Dan Messe, one of the founders and members of the band Hem, confirmed speculation that he would be writing the score for a musical adaptation of Amélie, collaborating with Craig Lucas and Nathan Tysen. Messe also confirmed he would be composing all original music for the show and not using the Yann Tiersen score. The musical adaptation premiered at the Berkeley Repertory Theater in August 2015. It opened on Broadway in March 2017 and closed in May 2017. The production started its pre-Broadway engagement at the Ahmanson Theatre in Los Angeles in December 2016, with Phillipa Soo in the title role. Jeunet distanced himself from the musical, saying he only sold the rights to raise funds for children's charity "Mécénat Chirurgie Cardiaque [fr]" (Cardiac Surgery Patronage). The film has no overall worldwide distributor, but Blu-ray Discs have been released in Canada and Australia. The first release occurred in Canada in September 2008 by TVA Films. This version did not contain any English subtitles and received criticisms regarding picture quality. In November 2009, an Australian release occurred. This time the version contained English subtitles and features no region coding. Momentum Pictures released a Blu-ray in the UK on 17 October 2011. The film is also available in HD on iTunes and other digital download services. For the 2007 television show Pushing Daisies, a "quirky fairy tale", American Broadcasting Company (ABC) sought an Amélie feel, with the same chords of "whimsy and spirit and magic". Pushing Daisies creator Bryan Fuller said Amélie is his favorite film. "All the things I love are represented in that movie", he said. "It's a movie that will make me cry based on kindness as opposed to sadness". The New York Times' review of Pushing Daisies reported "the Amélie influence on Pushing Daisies is everywhere". A species of frog was named Cochranella amelie. The scientist who named it said: "[T]his new species of glass frog is for Amélie, protagonist of the extraordinary movie Le Fabuleux Destin d'Amélie Poulain; a film where little details play an important role in the achievement of joie de vivre; like the important role that glass frogs and all amphibians and reptiles play in the health of our planet". The species was described in the scientific journal Zootaxa in an article entitled "An enigmatic new species of Glassfrog (Amphibia: Anura: Centrolenidae) from the Amazonian Andean slopes of Ecuador". ^ "AMELIE FROM MONTMARTRE (LE FABULEUX DESTIN D'AMELIE POULAIN) (15)". British Board of Film Classification. 17 July 2001. Retrieved 13 April 2013. ^ a b "Amélie (2001)". The Numbers. IMDb. Retrieved 25 September 2011. ^ "Foreign Language Movies at the Box Office". Box Office Mojo. Retrieved 25 January 2014. ^ "Amélie: filming locations". Movieloci.com. 23 July 2012. ^ "Amelie Movie Review by Anthony Leong from". MediaCircus.net. Retrieved 25 January 2014. ^ Dickerson, Jeff (10 April 2002). "Audrey Tautou and French film `Amelie' are pure movie magic". The Michigan Daily. Retrieved 9 March 2018. ^ Tobias, Scott. "Jean-Pierre Jeunet". The A.V. Club. Retrieved 28 April 2010. ^ Martin-Jones, David (1 March 2011). "Review: 'Colombiana: Europa Corp and the Ambiguous Geopolitics of the Action Movie'". Senses of Cinema. ^ "Amélie (2001)". Rotten Tomatoes. Fandango Media. Retrieved 10 April 2018. ^ "Amélie Reviews". Metacritic. CBS Interactive. 10 April 2018. ^ "Empire's Amelie Movie Review". Empireonline.com. Retrieved 25 January 2014. ^ "Review: 'Amelie' is imaginative". CNN. 7 November 2001. ^ "The Amélie Effect". Filmlinc.com. Archived from the original on 23 March 2012. Retrieved 21 September 2011. ^ "The 74th Academy Awards (2002) Nominees and Winners". oscars.org. Retrieved 19 November 2011. ^ "The Best 1,000 Movies Ever Made". The New York Times. 29 April 2003. Retrieved 23 April 2010. ^ "The 50 Best Movies of the Decade (2000–2009)". Paste Magazine. 3 November 2009. Retrieved 14 December 2011. ^ "BBC - Culture - The 21st Century's 100 greatest films". BBC Magazine. 23 August 2016. Retrieved 28 August 2016. ^ "Movies: 25 New Classic Posters". Entertainment Weekly. 27 June 2008. Retrieved 28 April 2010. ^ "New Classics: Romantic Gestures". Entertainment Weekly. Retrieved 28 April 2010. ^ "Was Amélie Really the Best-Shot Film of the Last Decade?". movieline.com. 29 June 2010. Archived from the original on 1 July 2010. Retrieved 5 June 2010. ^ "JEUNET, JEAN-PIERRE: FABULOUS DESTINY OF AMÉLIE". Urban Cinefile. 13 December 2001. Retrieved 5 June 2009. ^ "BBC News - Amelie musical to be made for Broadway". Bbc.co.uk. 23 August 2013. Retrieved 25 January 2014. ^ 23 August 2013, 9: 58 AM (23 August 2013). ""Amelie" becoming a Broadway musical". CBS News. Retrieved 25 January 2014. ^ "'Amelie' Set to be Adapted for Broadway". Broadway Tour. 26 August 2013. ^ Robert Hurwitt (14 September 2015). "Fanciful Film Floats Dreamily Onto the Stage with "Amélie"". San Francisco Chronicle. Retrieved 17 June 2016. ^ Viagas, Robert (17 June 2016). "Hamilton's Phillipa Soo Will Star in Amélie Musical on Broadway". Playbill. Retrieved 17 June 2016. ^ "Amélie, A New Musical". Center Theatre Group. Retrieved 15 December 2016. ^ Richford, Rhonda (28 August 2013). "'Amelie' Director Jean-Pierre Jeunet 'Disgusted' by Musical". The Hollywood Reporter. Retrieved 25 January 2014. ^ "Amelie Blu-ray (Le Fabuleux Destin d'Amélie Poulain) (2001)". Blu-ray.com. Retrieved 28 April 2010. ^ "Amelie Blu-ray (Le Fabuleux Destin d'Amélie Poulain) (2001)". Blu-ray.com. Archived from the original on 14 April 2010. Retrieved 28 April 2010. ^ Carter, Bill (5 July 2007). "A Touching Romance, if They Just Don't Touch". The New York Times. ^ "zt01572p082.pdf" (PDF). Retrieved 28 April 2010. ^ mp. "Zootaxa; a mega-journal for zoological taxonomists". Mapress.com. Retrieved 25 January 2014. ^ "An enigmatic new species of Glassfrog (Amphibia: Anura: Centrolenidae) from the Amazonian Andean slopes of Ecuador" (PDF). Mapress.com. 2007.